Miami Dolphins players kneel during the national anthem before their game against the Carolina Panthers at Bank of America Stadium on Nov. 13, 2017, in Charlotte, N.C. 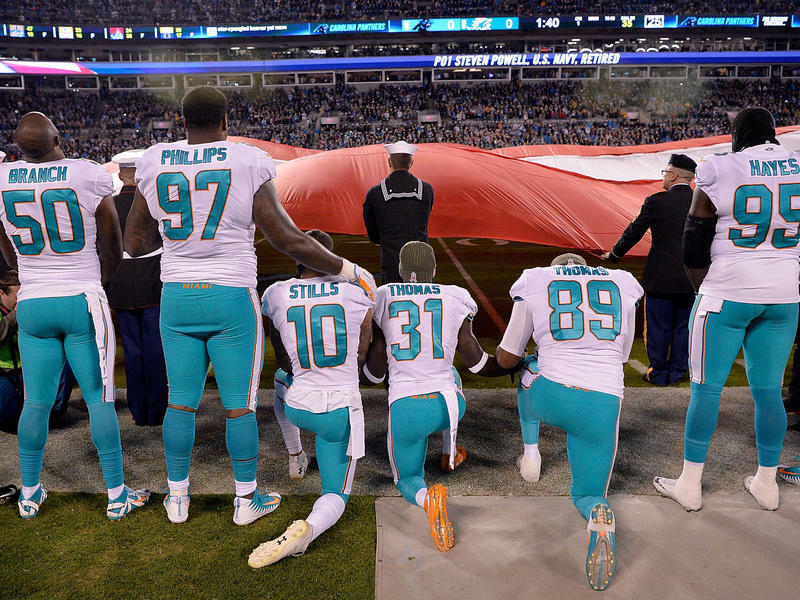 The National Football League and the NFL Players Association have agreed to suspend enforcement of new rules requiring players to stand during the pregame rendition of the national anthem, after a report that the Miami Dolphins would fine and/or suspend players for up to four games for violating the policy. A joint statement from the league and the players' union was issued late Thursday following a report from The Associated Press, citing an internal Dolphins document on the new penalties for defying the league-wide policy. The policy had not yet been made public. "The NFL and NFLPA, through recent discussions, have been working on a resolution to the anthem issue," the joint statement said. "In order to allow this constructive dialogue to continue, we have come to a standstill agreement on the NFLPA's grievance and on the NFL's anthem policy," it said. "No new rules relating to the anthem will be issued or enforced for the next several weeks while these confidential discussions are ongoing." The new league policy requiring athletes and staff to "stand and show respect for the flag and the Anthem" on the field was announced in May. The AP's earlier story cited an anonymous source for the Miami Dolphins document, which amounted to only one sentence in a nine-page document addresses the anthem issue. "It classifies anthem protests under a large list of 'conduct detrimental to the club,' all of which could lead to a paid or unpaid suspension, a fine or both," the AP wrote. The policy was issued this week, according to the wire service. Protests in the locker room are not prohibited. A team source tells NPR's Tom Goldman that all NFL teams were required to submit rules about the anthem before players reported to training camp — which for the Dolphins was on Wednesday. The source indicated that the team has not made a final decision about how to handle anthem protests. "We will address this issue once the season starts," the source said. "All options are still open." Multiple players, inspired by former San Francisco 49er Colin Kaepernick, had been kneeling during the anthem as a silent protest against police brutality against people of color. The league's policy did not define any punishments for any individual players who protest anyway — instead, it said teams would be fined. Punishments for individuals would be up to their teams. Before the AP's new report, no details were known about any team's policy. It is still not clear whether any other teams have similar policies. On Twitter, many sportswriters and high-profile fans denounced the idea of potentially suspending a player for a protest. Mike Freeman, who writes about the NFL for Bleacher Report, called the policy a "disgrace." Lindsey Ok, who blogs about the Baltimore Ravens, said she "[w]ould not hate it if the entire Miami Dolphins team protested and then they'd have to backtrack because they're not gonna suspend the entire team for 4 games." In a widely shared tweet, Mina Kimes, a senior writer for ESPN, pointed out that a four-game suspension would be a harsher punishment than Buccaneers quarterback Jameis Winston received for groping a female Uber driver. Chris Kluwe — the former Vikings punter who believes his football career was cut short because of his advocacy on behalf of gay rights — also issued a biting retort on Twitter. "Good to see the NFL owners remain committed to employing rapists, domestic abusers, and bigots, but won't hesitate to suspend players for speaking out on human rights," he wrote. But Adam Beasley, the Miami Herald's Dolphins reporter, said he would be "stunned" if the maximum punishment of a four-game suspension was ever actually enforced. Shortly after the leaguewide policy was first announced, the NFL Players Association filed a grievance against the league on behalf of players, saying the policy "infringes on players rights." Copyright 2018 NPR. To see more, visit http://www.npr.org/.